The hawari of Cairo - narrow non-straight alleyways - are the basic urban units that have formed the medieval city since its foundation back in 969 AD. Until early in the C20th, they made up the primary urban divisions of the city and were residential in nature. Contemporary hawari, by contrast, are increasingly dominated by commercial and industrial activity. This medieval urban maze of extremely short, broken, zigzag streets and dead ends are defensible territories, powerful institutions, and important social systems. While the hawari have been studied as an exemplar for urban structure of medieval Islamic urbanism, and as individual building typologies, this book is the first to examine in detail the socio-spatial practice of the architecture of home in the city. It investigates how people live, communicate and relate to each other within their houses or shared spaces of the alleys, and in doing so, to uncover several new socio-spatial dimensions and meanings in this architectural form. In an attempt to re-establish the link between architecture past and present, and to understand the changing social needs of communities, this book uncovers the notion of home as central to understand architecture in such a city with long history as Cairo. 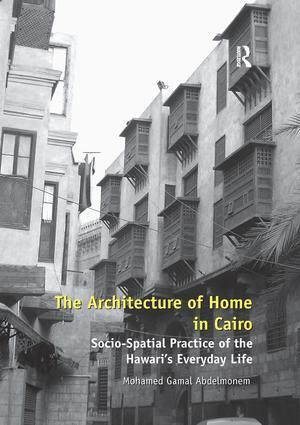 It firstly describes the historical development of the domestic spaces (indoor and outdoor), and provides an inclusive analysis of spaces of everyday activities in the hawari of old Cairo. It then broadens its analysis to other parts of the city, highlighting different customs and representations of home in the city at large. Cairo, in the context of this book, is represented as the most sophisticated urban centre in the Middle East with different and sometimes contrasting approaches to the architecture of home, as a practice and spatial system. In order to analyse the complexity and interconnectedness of the components and elements of the hawari as a 'collective home', it layers its narratives of architectural and social developments as a domestic environment over the past two hundred years, and in doing so, explores the in-depth social meaning and performance of spaces, both private and public. Dr Mohamed Gamal Abdelmonem, Lecturer in Architecture, Queen's University Belfast, United Kingdom.